Girls in Manchester are more likely than boys to have ‘unique’ names, and the names given to children are likely to reflect parents’ home languages and cultures, according to a new study carried out by Multilingual Manchester. Amy Portwood asked 120 local mothers about the names given to their children born between 2010- 2015 (now aged between two and six). She identified 160 names, almost two thirds of which did not appear on the Office for National Statistics’ list of top 100 names for the year in which the child was born. They were therefore classified as ‘unique’. The names of Manchester children reflect the city’s language and cultural diversity. Mothers who speak a language other than English in the home are more likely to give their children a ‘unique’ name. 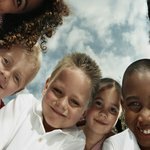 Of the children surveyed, 42.5% had mothers who stated a language other than English was spoken in the home, and of those 83% had a ‘unique’ name. Sixteen languages other than English were identified as home languages, with Urdu and Arabic being the most common. With few exceptions, children whose families spoke another language in the home had a name that derived from that language. Among children from Arabic speaking households, almost 90% had Arabic names. This suggests that naming is an important way for parents to maintain their cultural heritage.